The night vision technology was originally developed for military use only. The technology has provided numerous advantages to different military organizations. A night vision device (NVD) is an optical device that allows images to be created in levels of light approaching total darkness. Introduction of new sensors and devices for target acquisition and night seeing has increased capability of the armies in terms of continuous operations extending throughout day and night. Individual soldiers differ greatly in their ability to detect and see their targets while using different night vision devices. Across the globe, military, law enforcement, and security persons are likely to benefit greatly from use of the sensor fusion technology in night vision devices. Thus, the demand for night vision devices is rising at a rapid pace. However, as applications in commercial markets continue to advance, the demand is estimated to increase further in the near future. The global night vision device market is estimated to reach value of US$ 14,861.2 Mn by 2026 from US$ 6,964.8 Mn in 2017, expanding at a CAGR of 8.9% during the forecast period. Rising adoption and rapid improvement and upgrade of devices and weapons to be used by the defense personnel are expected to drive the global night vision device market during the forecast period. Encouragement from governments for using night vision devices for law enforcement is also driving the night vision device market. Furthermore, companies are continuously aiming at the upgrade of their existing product portfolio in order to enhance customer experience. This is projected to boost the night vision device market during the forecast period. 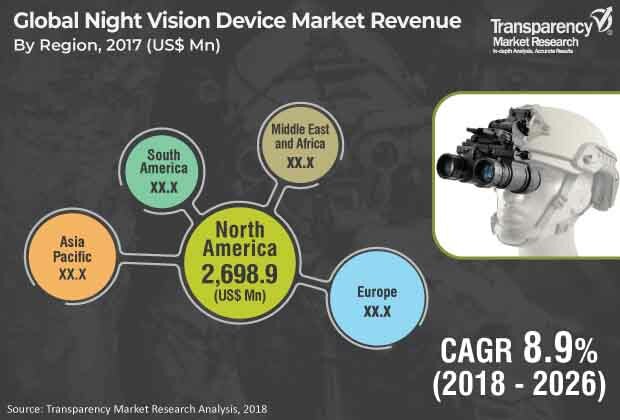 Automotive manufacturers are continuously focusing on adopting the night vision technology for their premium or luxury cars, which is also likely to propel the night vision device market during the forecast period. Moreover, widespread use of different night vision devices, such as scopes, goggles (bi-ocular and monocular), cameras, and binoculars, in border security led by high influx of refugees, increased cross-border operations, and the issue of immigrants is likely to boost the global night vision device (NVD) market during the forecast period. Furthermore, constant upgrade in the functioning and design of night vision cameras to make them more efficient for use in military and defense operations is fueling the global night vision device market. In recent years, an increasing number of consumers have turned toward night vision devices so as to operate in darkness. Use of night vision devices for nighttime hunting, photography, personal security, and fishing has become commonplace. Growing trend of adoption of the night vision technology for hunting, photography, and fishing is expected to create lucrative opportunities for the global night vision device market during the forecast period. However, the cost of regular maintenance of night vision equipment and devices is very high. This acts as a restraining factor for the global night vision device market. The global night vision device market is fragmented with a large number of companies operating in the market. Leading players are currently focusing on providing technologically advanced products to customers. Increasing demand for night vision device applications with their cost decreasing in the long run is expected to encourage investors to invest in the night vision technology in the next few years. Maintaining quality standards is essential for manufacturers of night vision devices in order to adhere to stringent government regulations set for different end-use industries in various countries across the world. Moreover, as a part of their strategy, companies are engaging in various acquisitions; focusing on expanding their business; and entering into strategic partnerships. Some of the major players operating in the global night vision device market and profiled in the study are Armasight, ATN Corporation, BAE Systems, FLIR Systems, Inc., Harris Corporation, L-3 Communications, Meopta, Newcon Optik, Optix, Sofradir EC, and Thales Group.